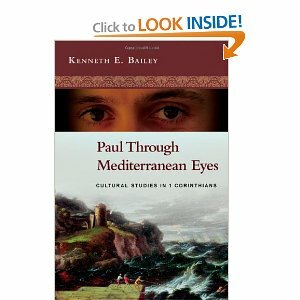 I just finished reading Kenneth Bailey’s Paul Through Mediterranean Eyes. I have loved reading Bailey’s other works on the parables of Jesus and, especially, the Prodigal Son. In the book Bailey takes up Paul’s first epistle to the Corinthians. The strength of Bailey’s reflections on Paul is his analysis of Paul’s rhetoric. His identification of Paul’s use of chiasms and Paul’s appeal to Isaiah and Amos enlightens and clarifies anyone’s reading of 1 Corinthians. Although Bailey’s commentary isn’t as quite as informative (he primarily follows Thiselton and Fee), his autobiographical asides from experiences in the Middle East are jewels hidden throughout the text for the reader to discover and to sense the power of Paul’s letter for contemporary disciples in the Mediterranean and beyond. « Christian Ministry as a Contributor to Poverty?